Northwood is committed to respecting, and acting in a manner which avoids infringing on, human rights, and will actively seek to ensure we are not complicit in human rights abuses committed by others (whether this be modern slavery, forced labour or human trafficking in our supply chain). 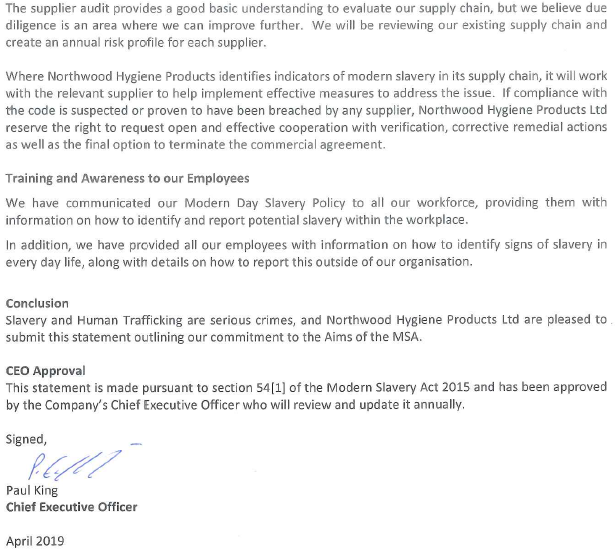 Therefore Northwood fully embraces the aims and ideals of the Modern Slavery Act 2015, and have started the journey on how to analyse and then implement its intentions throughout our own business and extended supply chain. To this end we have developed an official Anti-Slavery Policy, and are undertaking the education and implementation of this policy both in our own business and with our major supply partners.